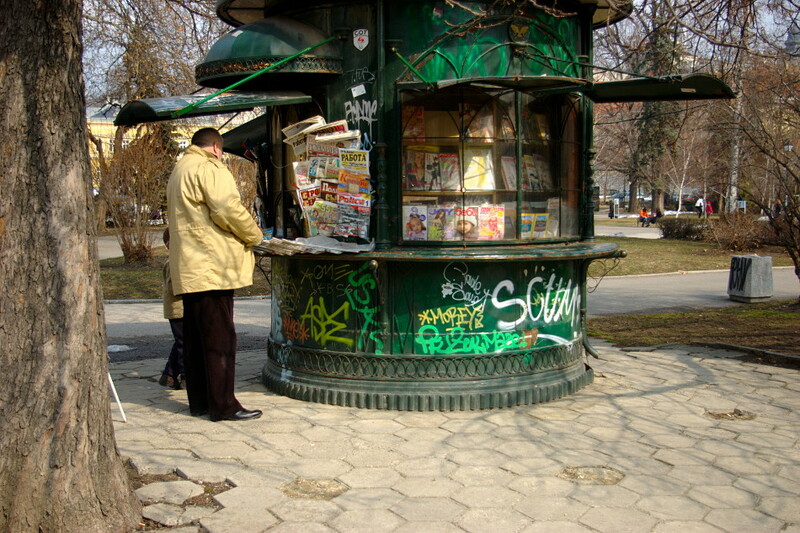 An old newspaper stand in the central park in Sofia, Bulgaria. I think I can remember seeing this one long ago when I was a little kid -- it was on the alternative route to my french lessons at the "Alliance FranÃ§aise". Located in the little park in central Sofia that once, before the communist era, was the garden of the Tzar's pallace and facing the street, on which during the pro-soviet rule was the US embassy and other "exotic" for those years things like Air France bureau, for instance. Well, at least I think it is that old. It may be newer. But still, it's some kind of a local landmark to me. I took this photo during a photowalk with some of my street photo buddies. We haven't met for about two years and now we start shooting again. The day was warm and sunny, one of the first spring days after the really cold and snowy winter that we had over here.